In January we’ve got some local programs running, and Helen will be completing her Wilderness First Responder. In February there’s Paddle Golden Gate. It’s an awesome event, and well worth checking out, if you haven’t done so already. 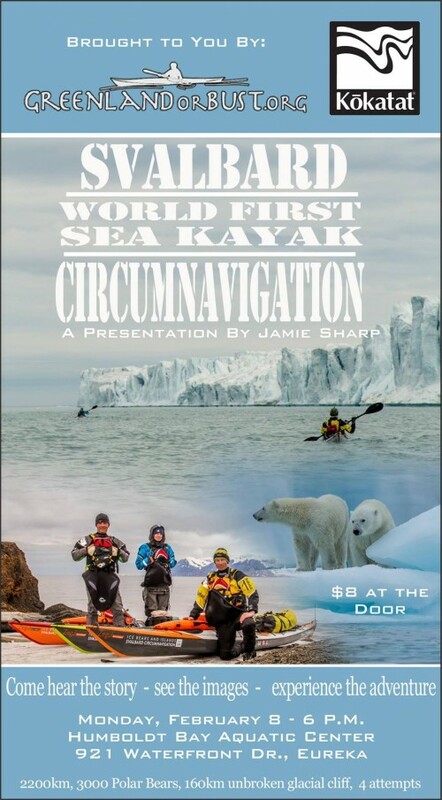 After that, Greenland or Bust and Kokatat are bringing Jaime Sharp to Eureka, California for Ice Bears and Islands, a presentation on Svalbard’s world first sea kayak circumnavigation. For more, please see the flyer below, or e-mail info@greenlandorbust.org. Proper Planning And Preparation Will Prevent a Poor Performance – Get to know the area where you will be tested. Paddle it a few times in different weather/tidal conditions, so your chart is there as a backup, not as your primary means of knowing your location. Fail to Prepare, Prepare to Fail – Set out lots of ‘desk-top’ plans beforehand, so when on the water you can create several ‘deck-top’ plans in your head, at any one time: a five minute plan, a 30 minute plan and a one hour plan. Your aim is to be implementing the 5 minute plan, working towards the 30 minute plan, and keeping the one hour plan in perspective. Be Brave. Take Risks. Nothing Can Substitute Experience – If you are ‘experienced’ then it stands to reason that you will draw confidence from having built up a breadth of personal knowledge, thus enabling you to make sound judgment calls as and when they are required. Come Prepared To Take The Helm – If you are not so ‘experienced’ then you need a bombproof game plan or live on your wits, which will be stressful! This is the hardest way of passing; a good examiner will detect a candidate’s lack of flexibility and will try to force judgment calls, potentially then forcing mistakes to be made. After all, they need to see if a candidate is safe in any situation. To Prepare Is Half The Victory – Be ready to use your safety equipment, especially your towline, more than once and often in quick succession. Sort out an effective roll and be ready with a quick re-entry; this is a set piece and really highlights good paddling skills, or lack of. Make sure the kit you have is functional, accessible but also easily stowed and secured. Stay calm and do what you always do, not what you think someone else wants you to do. “Be prepared, work hard, and hope for a little luck. Recognize that the harder you work and the better prepared you are, the more luck you might have” – Ed Bradley.